The market went down last week on some bad news from Europe, the bad local news and in general, the lack of any good news whatsoever. 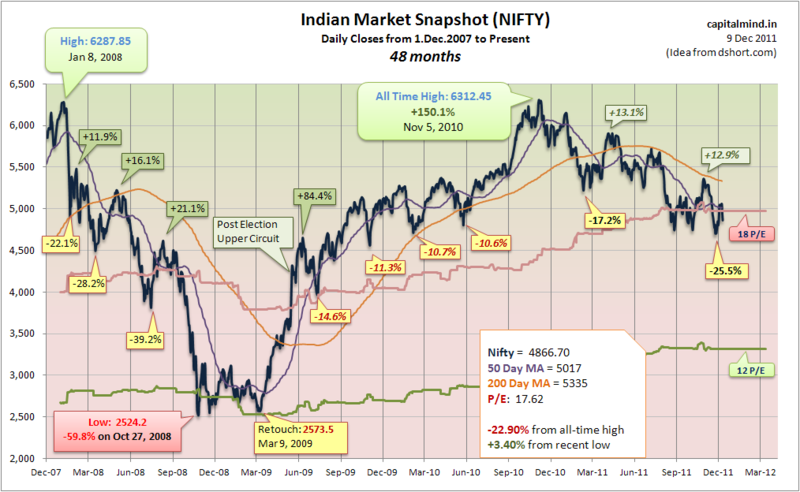 The Nifty ended down 3.6% at 4866, bouncing back below the 50 Day moving average and going to a P/E below 18 once again. Now consider that four years ago, in December 2007, we were at 5900 pm on the Nifty and now we are 20% lower. The Five Year CAGR is under 5% now. And the European drama isn’t over yet. Brace yourself for more volatility.